Graphic Novels are effective high interest resources to engage and motivate reluctant middle school and high school readers. 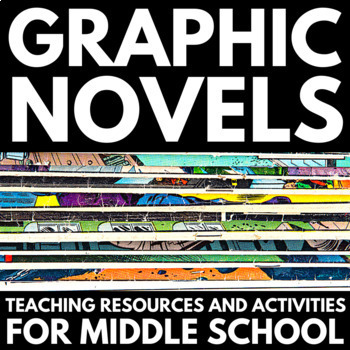 This teaching resource bundle contains everything you need to teach the characteristics and features of graphic novels, and to show students how to read this form of writing with purpose to encourage deep analysis. Graphic Novel List – An extensive, multi-page list of graphic novels perfect for middle school and high school readers. 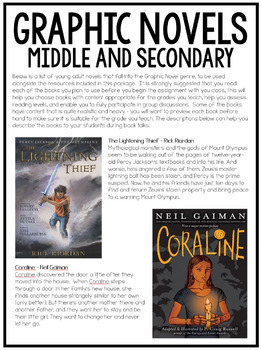 These include detailed descriptions of each novel, and allow you to choose books perfect for your individual classroom needs. What are Graphic Novels? : A full page handout describing exactly what Graphic Novels are, and why they are so engaging. Why Should You Teach Graphic Novels? : A full page handout describing the benefits of using this exciting form of writing in your classroom. How do you read Graphic Novels? : Two pages of information describing exactly how to read Graphic Novels, including descriptions and examples of speech balloons, panels, gutters, thought bubbles, captions, frames, and onomatopoeia. These handouts are a great way to introduce this form of writing to students. Graphic Novels: Things to remember: A page of tips, tricks, and important facts about graphic novels. Graphic Novel Creation Project: Students use the information included in this handout to help them create their own graphic novels. This is a great way to extend student knowledge and have them write creatively. 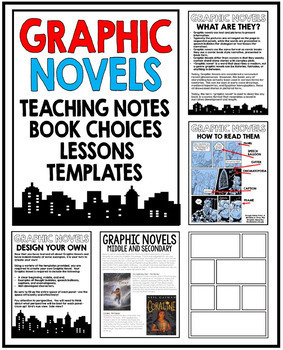 Graphic Novel Templates: A variety of templates are included, to help students create their own graphic novels. Additional Activities: A full page of additional activity ideas to use with graphic novels - great for extension and differentiation!